Every weekday, Kong, a sixth grade student from Laos bikes along the Mekong River to attend her early morning classes. Standing in straight lines with her schoolmates for the morning salute to the national flag, the fifteen-year-old girl seems like any other regular student. But Kong is different from her peers. She is a foreigner in this school in Thailand’s border province of Nong Khai. Kong Kaewprasert is one of seven Lao citizen students at Luang Phurian Uppatham School in Nong Khai Province’s Sri Chiang Mai District. Instead of a national identification card, Kong carries a thirteen-digit identification number issued by the school that allows her to attend classes free of charge. It also gives her some protection from getting arrested or deported. Kong is one of the luckier foreign students in Thai schools. Only one in three foreign children in Thailand are currently enrolled despite the Thai state’s obligations under international human rights agreements. 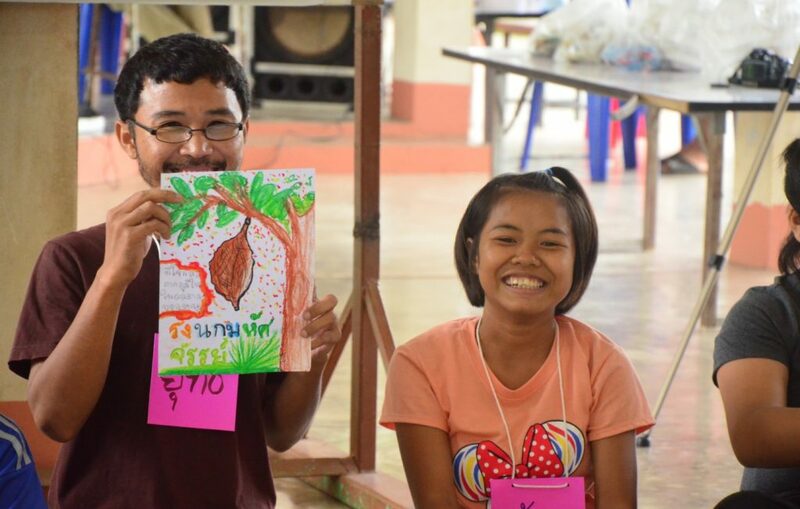 It was poverty that brought her parents to Thailand in the first place, and it was their low education level that limited their employment options. Kong grew up in a rural village in Luang Prabang Province in northern Laos, where most people make a living as farmers producing rice, cotton, and vegetables. She attended elementary school for four years at the small school that had no electricity and could only be reached by boat. Stricken by poverty, Kong’s parents decided to find a better future in Thailand so that they could support their three children. They first travelled to southern Thailand to look for work leaving behind Kong, the eldest child, to look after her two siblings. But the parents’ four-year Lao education made it difficult for them to land a job in the South. They chose to look for employment elsewhere. Eventually they found work on a pineapple farm in Nong Khai Province, and brought their children to live with them. “My parents first took Boonjin, my younger brother, [to Thailand]” Kong recalls. “After that, they came back and took me and Waeodao, my little sister, with them. Because of this, Boonjin started first grade before me,” Kong says, explaining how her little brother came to be her senior in school. Kong says she prefers the Thai educational system to the Lao system. In her home country, education is not free, and students have to buy all school supplies themselves. In Thailand, many supplies are given for free, and schools provide lunch. Kong and her two siblings are at the top of their classes at Luang Phurian Uppatham School, according to their teachers. Beyond excelling academically, Kong was made the student president at her school, among her 110 schoolmates – surely one of the few schools in Thailand where a foreigner has such a position. Among about 300,000 noncitizen children in Thailand, Kong is one of the few who is fortunate enough to have free access to education. This is despite the Universal Declaration of Human Rights (UDHR) – to which Thailand is a state party – specifying that every child be entitled to fifteen years of free education regardless of their status or citizenship. Non-governmental organizations have long expressed concerns that Thailand’s is not wholly fulfilling its obligation, noting that some schools in the country bar non-citizens from enrolling in their programs. Since 2005, Thailand’s government has provided education to all residents of the country, including those without Thai citizenship or civil registration records. Non-citizen can choose any type of school in any location. Educational institutions that enroll non-citizen students receive an additional budget based on the number of students. “We take care of the kids from Laos like we do with the Thai kids. The Lao kids are diligent, dedicated, and well-behaved. We treat them equally; everyone is given the same benefits,” says Wanwisa Kongkaew, director of Luang Phurian Uppatham School. Ms. Wanwisa says that the Lao students are entitled to all benefits, including the per-student budget from the government and the fund for uniforms, books, and food. According to the rules, however, all noncitizen students have to start over from the first grade. Luang Phurian Uppatham School’s policy is in line with Section 14 of the International Covenant on Economic, Social, and Cultural Rights (ICESCR), which Thailand ratified in 1999. The section specifies that state parties must provide mandatory elementary education to all for free regardless of whether they are citizens with proper legal documents or not. Furthermore, the Convention on the Rights of the Child, which Thailand has been a member of since 1992, also makes education to be a human right. In light of these international agreements, it is Thailand’s legal duty to provide education to all people regardless of citizenship and without discrimination. But according to a 2014 report by World Education and Save the Children over 200,000 migrant children are out of school. A majority of migrant children enrolled in the Thai education system are at the kindergarten or elementary level, but available government data suggest that only one to three percent attend lower and upper secondary schools. Khampin Aksorn, Coordinator of the Friends of the Mekong River Group, a NGO working with stateless people, says that in principle noncitizen or stateless children should have no problem attending high school or universities in Thailand, according to the government’s Education For All (EFA) policy. But some educational institutions do not follow this policy, often leaving noncitizen students deciding not to enroll in order to avoid complicated circumstances. Most noncitizen students do not continue their education after the sixth or ninth grade, Ms. Khampin says. Thailand’s policy on providing free education covers only tuition, often leaving students to bear the burden of other costs, such as travel and food. Even though noncitizen students can attend school and attain degrees like Thai students, they might not be eligible to take out a student loan. Her little brother Boonjin passed the entrance exam to continue his education in a district school, but as the oldest child of the family, Kong is unsure if she will be able follow track. “I want to become a teacher when I grow up, but I doubt I will be able to since my family does not a lot of money,” Kong says, expressing her doubts that higher education will be an option in her new home. *This article was first published in The Isaan Record on 06 December 2016 and republished with permission. Mingkhawan Thuemor is a participant of The Isaan Journalism Network Project organized by The Isaan Record to train journalists in the Northeast and increase news coverage of the region.